The name of the tree is Cannonball Tree and its flowers are in the shape of a snake hood over a Shivling. The Shivling shape is very small. The tree is known as Shivlingachi Fula in Goa and Maharashtra. The tree is also found in South India especially in Kerala. 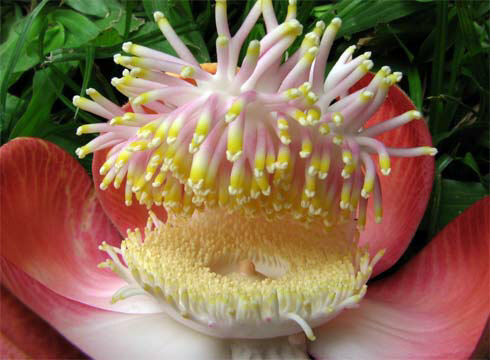 In Goa, Couroupita guianensis is popular as Shivalinga Chya fulanche zhad as the petals of the flowers resemble the hood of a naga or cobra who is considered as a sacred snake, protecting a Shivling. The tree, because of its brown and spherical shaped cannon ball like fruit, is also known as cannon ball tree. The flowers are orange, scarlet and pink in colour and form large bunches. The flowers do not have nectar but carpenter bees act as pollinators. Both fruits and flowers grow on the tree's trunk. Though the tree is native to the northern portion of South America, especially the Amazon basin and the southern Caribbean, it became one with Indian soil more than a thousand years ago.